Q: Fernando, another pole to flag victory but you had to work extremely hard for this one in every sense. Just 0.2 seconds the winning margin. Fernando ALONSO: Yeah, very good stuff. The race was long and with the safety car problems and also the people we were lapping especially at the end we found a group of five cars. They lost one lap and it was difficult to lap them. There was a yellow flag on the straight because of the Lotus problem, the car on fire, so we could not overtake there so, it was difficult to manage the gap with the guys in front. Not to overtake under the yellow, anything like that, so a lot of precaution in the last couple of laps, taking it very easy. We know how difficult it is to overtake here, so I just controlled the gap with Sebastian as much as I could and not taking any risk. Q: Sebastian, you pushed Fernando to the absolute limit today but it wasn't to be. Did you ever think at any stage of the race that it might be on, particularly in the closing stages? Sebastian VETTEL: Well, obviously it was the only chance I had. Unfortunately in the beginning I had to let him go a little bit and then towards the end of the first stint the soft tyres were pretty much at the end. The car was sliding a lot. We came in at the same lap. Unfortunately at the pit stop I had a little mistake but I think it would have been very close. That is the story of the whole race. I tried to push him as hard as I could into a mistake. He didn't do a major mistake so as he said it is difficult to overtake here and it would have been too risky, so in the end we got away with second, good points. But the most important is that the car is quick, competitive all weekend. There was a bit missing yesterday and probably that was what I was missing today. I had a very good start, so I think we made good progress on that. In the end it is good to get good points for the team. It helps us a lot in the Constructors' Championship and in the Drivers' Championship everything is still very much open. Q: Mark, you took a big gamble on tyre strategy early on in the race. It paid off just, but what about that collision with Lewis Hamilton? Mark WEBBER: Well, first of all back to the start. The start was pretty good, so thanks very much to the team. As Seb touched on he had a pretty good one too, so that is good for us to get away and sets the base of the race in a better fashion. Settled into the first stint. Safety car early. Then as you said we decided to pit. I questioned the team to start with and they said it is the right thing, let's have a go. We pitted and I thought 'oh, this is going to be a long stint on the primes'. We came back out and when we re-queued up on the safety car I thought 'okay that's not too bad'. We were in a reasonable position. I passed a few guys and then I got to Rubens (Barrichello) and he was driving very well. I couldn't clear him. Then another re-start and it is very difficult to get away cleanly when you have got the backmarkers involved. I got caught up behind one of the Virgins. I don't know which driver it was. He was doing his best but Lewis got a big run of me. It was pretty harsh for me to have to clear those guys. He could set me up and have a crack at me. Unfortunately we made contact. The contact was similar to what he had in Monza with Felipe (Massa) and it could have easily been my front right tyre over as well. It was not desirable. It was a key part of the race for me to keep him out and there was contact, so it is not something you want to do all the time. After that I had a pretty decent vibration in the front end of the car, very worried if the car would get home to the end. But these two guys drove a fantastic race today. All weekend they drove very well and it was a good race for everyone to see and I am very happy with third. Q: Fernando, two hours driving in these temperatures. Tell us how hard that was physically and how much this win means for you today. Alonso: Well, it was very difficult. We knew that before we came here. We know Singapore physically is maybe the toughest race of the season. Two hours with this humidity in a street circuit with no time to breathe, 24, 25 corners, so it was tough to drive. This wins means a lot. Coming from Monza we knew that that was a unique lay-out, so we wanted to confirm in a normal track - even if Singapore is still a very special lay-out as well - but with more downforce that the car is performing well. We did it, so this win means a lot to keep in the fight in the championship. We know there are still four races to go but it seems we can be competitive in any track, so thanks to the team. Great job at the factory. Great job at the track as well getting 100 per cent of our potential all the time, so let's see in the remaining races. Forza Ferrari! Q: Sebastian, tell us in more detail about the start. Your move and Fernando's response into turn one. Vettel: Well, my move was pretty straightforward. I just went straight. I could see immediately that I had a very good start. It would have been enough for turn one but obviously Fernando closed and went to the inside, so there was no way to go. It would have made the angle for the first corner pretty tight, so I decided to go on the right and try to catch more speed for the rest of the lap. Yeah, that was that. As Mark said and I before, very good efforts on the starts. We have been criticised, wrongly I think, in the past but it is good to come here on a street circuit where it is always tricky to get the right settings for the start and we did both very good starts, so happy with that. Q: Mark, I guess the main thing for you is that you are still leading the World Championship. Webber: Hey look, I am very happy with third place today. It has been a pretty difficult weekend here to be honest for me. Probably the toughest weekend of the year for me. In Monaco it was the other way around on a street circuit. I felt incredibly comfortable. Did not feel mega-comfortable here most of the weekend but very, very happy with how the race went for me. To get third place out of it. There were parts of the race where I had to stay composed, not panic and it is very easy to get worried about losing so much time behind the guys who are a bit slower, so yeah, getting out of bed this morning I would have taken third. It is a pretty good podium. Of course Fernando is still hanging in there, so need to try and get rid of him somehow, but it is going okay. Q: Fernando, you have scored the most points of anybody in the last five races. Should we bet our money on you now for the championship? Alonso: I think it remains very tight. All five contenders still have the same possibilities. Mark has a little bit more with still some margin to have a bad weekend not putting at risk the contention of the championship. For the others we need to keep catching if we can. We will do our best. We do not know if it will be enough to become champion in Abu Dhabi. But we will give 100 per cent. Hopefully it is enough but people can be sure we will fight until the end. Alonso: First stint 100 per cent or 95 as we knew that we had to open a gap first from Webber as he stopped and we had this 30 seconds to open a gap to be able to stop and stay in front of him as he stopped when the safety car was out. To open this gap we were pushing maximum and then to open as much gap to Sebastian to have a little easy pit stop with him not too close. But after putting on the prime tyres obviously we reduced the pace and once with engine side and then mechanical side and then with the driving style as well. We knew that overtaking is nearly impossible here, so we knew we had to avoid any mistake. The walls are very close here and we just try to control the backmarkers as you can lose a lot of time. That was the risky point only. Q: What about brakes and tyres? Brakes, obviously, very tough around here. Q: Physically, from a concentration point of view also? Alonso: Not the easiest race for sure. We know physically it is probably the toughest one. The humidity, lay-out with no time to breathe. A lot of corners, 24, 25 corners, so very demanding physically but also concentration-wise we know that it is the longest race of the championship, nearly two hours driving with no room to make a mistake in terms of walls, etc. Tough but we knew it and we were prepared. All the drivers finished the race in the best condition possible. Q: Sebastian, you seemed to shadow him all the way but never got any closer? Vettel: Yeah, not really. I was hoping for him to hit the wall but he didn't do it. It is very tough around here to overtake. 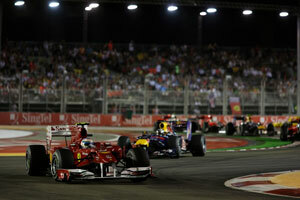 It is nearly impossible if Fernando did a good job and they had a very strong pace in the race. Probably a little bit stronger than we expected. At the beginning of the race it was a bit difficult. With the soft tyres we were struggling a little bit to keep up with him. Initially it was fine but then towards the end, before the pit stop, a couple of laps, the last 10 laps before the stop, it was quite difficult to stay with him. We had to be careful as if you run behind another car all the time the car is significantly hotter in temperatures for brakes, for the engine, so it was cleverer to back off a little bit and control the gap. Towards the pit stop we closed the gap. Unfortunately I made a little mistake on the mini launch but I think it would have been very close. Possibly the best chance in the race was at the start. I had a very good start but hoped for turn one to be a little bit further down the road. That was pretty much the story of the whole race. Trying to push him as hard as I could. It is not a big secret, it is not easy to follow and always be within one second of him. It is as close as it is going to get. If I was a bit closer, then the next two laps I could feel it. I was dropping off a bit and then getting close again. I think the pace was very good. It is difficult to say as we don't know how quick Fernando went and how much margin he had but being able to follow him comfortably I think the car was in a very good state. It worked well all weekend. Unfortunately there was a bit missing yesterday and that was a big percentage of the race result today. But, nonetheless, we can be very proud of what we did. Against all expectations we both had a very good launch and we can look forward. The tracks coming up should suit our car very well. Q: And second place, the points are ideal. Vettel: Yeah, it is good points. In the end we have now got four races. It is very tight. I think any of the five drivers at the top of the championship still have a very good chance. Things can change quickly. Best case look at Fernando. People wrote him off for the championship twice already and he is back. You win one or two races in a row and you are back again. The most important is the consistency and as I said, I am confident as we have a very strong car and a good team, so keep our heads down and get the maximum out of us. Q: Mark, we talked about that early stop but what were the tyres like at the end? Webber: Perfect actually! Completely finished. Fifty eight laps, yeah, there was not much left of them, and obviously there is a lot of straightline and exiting on this track, so the rear performance of the tyres is very important. First of all, to recap on the race a little bit, the start was very good, so thanks again to the guys there, they've done a very, very good job. Gavin and all the guys have done a good job there with the starts. We both got away well which puts you on a good foundation to get going. Safety car early, pitted, I questioned the team, to be honest. I thought 'hmm, I'm not sure about this, we go back a lot', but it looked like the field already... or I was surprised I didn't lose as many positions, so that was good. Then I came back out, I had to clear a few guys. Michael (Schumacher) was very good, fair. I had a good battle with him. Then I got to Rubens. First of all I followed (Kamui) Kobayashi, just for a few laps. I thought 'my God, if he drives like that for two hours it's going to be interesting' but he was really on the limit and missing all the walls and jumping kerbs and I thought 'God, I've got to get past him as quick as possible.' And then I got to Michael, so that was good and I had a good fight with him. And then Rubens was driving well and clean. The Williams was not too bad in certain sections of the lap, so that made it difficult to get the move done on him. Then it turned into an incredibly strategic race for us, also mechanically and lots of things with the car. The team did a great job keeping me informed. Restart, after everyone stopped I went to third. On the restart I had to clear both Virgins which makes it very difficult if you're the attacker in this case, which was Lewis. It's very easy to be set up and then to have a slipstream. Unfortunately we made contact, very similar to like he was with Felipe in Monza, just touching the front right on the inside of the back tyre. I was pretty much locked up - not locked up but I was trying to get the front away and I was very concerned that I had damage. For sure, the vibration was quite solid after that. Yeah, I made contact and I just had to get the car home from there on a completely finished set of tyres. Q: And fortunately no pressure from Jenson (Button) at the end. Webber: No, that was useful. It was just enough to keep the gap nice. That's how it was. It was similar in Budapest, when I went very, very long on the options and then when I came back out it was very, very nice on the primes and you can drive away, so I knew I had absolutely no chance with these guys and congratulations to both of them, they both drove a very good race. For two hours it's a long race to watch, it's certainly long enough for us and certainly long enough for the spectators to watch us going round for two hours, so maybe there's something we can look at, which Fernando I know has spoken about, but apart from that it was a very good event. Q: (Mat Coch) Fernando, before Monza you rated your championship chances about fifty percent. How would you rate your chances now? Sebastian and Mark, how would you both consider your chances? Alonso: When I said fifty, it was yes or no, I can win or I cannot win. It depends on how things and how the races go. In fact if we are five drivers, we have around a twenty per cent chance each of us, maybe Mark a little bit more because he's in front. We saw now, in two races, I was very bad after Spa in terms of championship points, not any more for the title fight. People thought a very bad 2010 championship etc, a lot of mistakes and now, after two races I am second in the championship, eleven points behind Mark, I think. Anything can happen in these four races, any of us can win two or three consecutive races and put you in a very good position or you have one or two retirements and you are completely out of it, you are mathematically out of the championship. So we need to keep concentration, keep the focus and as I said, the chances for all of us are more or less the same. It will depend on how these four races go, hopefully with no mistakes, with very high concentration from all the team and hopefully we keep the same way and keep momentum in Japan as well. Q: (Alvaro Faes - La Nueva Espana) Fernando, is today the moment in the year that you are more convinced, more concerned that you can win the championship? Alonso: Well, having a championship that is ten months long, or nine months, doesn't happen in any other sport normally, even the football league is not that long. We are in a sport where you cannot be a hundred percent or you cannot be completely fit, focused, motivated one hundred percent all the races, every month, so we go up and down, this is normal for all the sports. We can say that now, in this part of the championship I'm at a peak, one hundred percent of motivation, concentration etc., so it's good to arrive now. Sometimes in the championship, in September, I was getting tired, all these long flights now, at the end of the championship, very stressed all championship long. This year it is different. It feels like the championship starts now, so I feel very happy to go to Japan straight away. Q: (Michael Schmidt - Auto, Motor und Sport) Mark, when you had your battle with Lewis it seemed he had his nose a little bit ahead of you but do you think he gave you enough room, and were you concerned when the team told you there was a stewards' investigation? Webber: Lewis was certainly a little bit ahead, yeah. As I said, it was probably similar to the last race with Felipe and Lewis. Felipe probably didn't really even know he was there because there was contact, Lewis was quite a long way back from behind and this can happen sometimes in open-wheel racing. We brake completely on the limit. For sure it was incredibly tight. We did not hit that hard but it was enough to nearly put both of us out of the race. Fortunately I continued, and that was it. Q: (Flavio Vanetti - Corriere della Sera) Mark, when you decided to change your tyres so early, was Hamilton your main target or did you imagine you could catch Fernando and Sebastian? Webber: To be honest I was surprised that I was even going to get as far as Lewis, because I asked the team what was the gap to Jenson in front of Robert (Kubica), because I knew I would clear both Rubens and Robert because I could see them, but I couldn't see Jenson and I couldn't also see Robert's pit board to see how far Jenson was ahead of him, so I needed to get confirmation from the team because I was looking for the pit board to see how far ahead the other guys were. Then they said 'it's Lewis', so I thought 'OK, that's beautiful, third place, hopefully it can work well' and then I thought 'God, I'm losing so much time behind these guys, the leaders will be pulling away for sure'. I saw a little bit on the big screen that Fernando had a bit of a gap and then it was Seb and then I saw Lewis on his own, so I thought 'yeah, that's probably the maximum I'm going to get' which was third place out of the strategy and that worked very well. Q: (Bob McKenzie - The Daily Express) Mark, just to clear up, do you think Lewis was a bit ambitious at that point? Webber: No, he had to have a go, he saw that it was very difficult for me to clear the Virgins. We know that with this regulation where we have backmarkers in the queue on a restart it's not easy for the guy in front, which was my case, to clear the backmarker. Lewis had a pretty good run on me, but that is the only corner on the track where stuff can happen. Fernando and I had contact there last year, where it was close to contact. When you're on a restart, when things are a little bit cold, it's the same for all of us. We know it's a key point in the race to get right and obviously neither of us wanted to give an inch and in this case it ended up in some contact. Q: (Frederic Ferret - L'Equipe) Fernando, how do you rate your Ferrari for the last four tracks and same question to the Red Bull drivers? Alonso: I think some of them will suit our car a little bit better, some of them a little bit better for McLaren or Red Bull but we need to get the maximum out of our car. We know that sometimes we will be on pole, sometimes we will be third but there's nothing we can do. We remain more or less confident after the Spa performance and the pace in the race here and qualifying yesterday, so we don't have any particular worries at any of the tracks but we also know that there will be some weekends which will be very difficult for us with Red Bull very strong or McLaren, so we need to really keep getting the maximum out of the car. It's impossible to know which tracks but I'm sure that we will have some which will be tough for all of us, sometimes for one team, sometimes for others. Vettel: I think it's looking good. We are Red Bull, we are in a unique position again this year and we are horny - can you say that in English or does it not make too much sense? I think we have a very good chance. Obviously Korea is coming up which is unknown, no one knows. Other than that, if you look at Japan, Brazil and Abu Dhabi, I think we have a very strong car. Q: (Andrea Cremonesi - La Gazzetta dello Sport) Fernando, in Hungary the disadvantage from the Red Bull guys was quite huge. How did you recover as a team and this is one of your tracks, you've won twice and been third. How have you achieved this improvement personally? Alonso: Budapest, I think, is still a very different track compared to this one. There, I think Red Bull fulfilled a hundred percent of their potential. It was a circuit that was really good for them. Set-up, strategy, everything worked fine for them and maybe we didn't get the maximum from ourselves in Budapest and here maybe it was the opposite. The characteristics of the car are not only important but also the set-up and approach to the weekend itself. Here in Singapore, I really love this track. As you said, for whatever reasons it suits my driving style very well. Both years at Renault we were not in Q3 most of the championship, and we arrived in Singapore and we were quickest. This year, also, it's been a good weekend for me, so it's still a very special circuit for me. Q: (Heikki Kulta - Turun Sanomat) Fernando, was this the most precise race you have ever done, optimum all the time? Alonso: No, I don't know. I think I did some better races last year but people, when you're eleventh, don't worry too much about your race. When you are in a Ferrari and you win a race everyone is looking at you and supporting you. I think we always try to drive well, make no mistakes, very precisely, especially on this type of circuit but today was team work again with a good preparation yesterday, a good pit stop, good strategy, good management of the tyres, brakes etc., so there are many factors to win the Singapore Grand Prix and Ferrari did everything OK again. So thanks to the team. Q: (Tony Dodgins - Tony Dodgins Associates) Seb, I think you said you were struggling a bit to hold Fernando towards the end of that stint on the options but you were still going quicker than anybody on primes, so were you a bit surprised they didn't keep you out another couple of laps? Vettel: No, I think on options you could see generally that everyone was struggling towards the end. I could see Fernando in front of me, obviously. He was sliding a lot and so was I. The rear tyres were starting to go off. I made a maximum effort to get as close as I could in the end. We could have maybe tried to stay a lap longer or a lap shorter. I don't think it was possible with the gap. But on the other hand, you go out with the prime and you end up with a new tyre and it's just so much better, so even staying out I think would have just enlarged the gap to Fernando, so in the end I think it was fair to come in, put some pressure on Ferrari for the pit stop because obviously everyone knows that our pit stops are very strong, so unfortunately, as I said, I had a bit of a wobble with the get-away but I think they had a clean stop as well, so the gap he had in the pit lane - probably half a second - was still good enough. Unfortunately it was not enough today but I think if you follow another car closely as we did for the main part of the race - I don't know if anybody else did during the race - you obviously could go faster, you never know how fast, because you're not in clean air, but I think the pace was good all weekend. I will still take second.